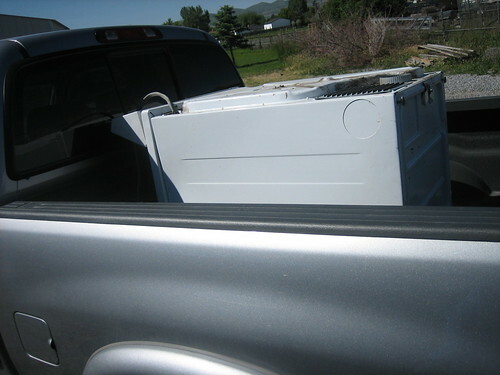 Put a dryer in the back of your truck. Seriously. So a few weeks ago I bought a washer and dryer off of craigslist for $25. I only needed the washer, but the guy I bought them from told me I couldn’t take the washer unless I took the dryer too. I have no idea if the dryer even works. I haven’t figured out what to do with it yet so I’ve just left it in the back of the truck. The last time I filled up the gas tank I reset the trip odometer or whatever it’s called. The tank is now almost empty and I’ve driven about 75 miles over what I usually do on a tank. No really. The dryer. Since it’s been back there I’ve been driving more cautiously, not taking corners as fast as before and not accelerating/decelerating so quickly. Don’t get me wrong. I’m not a crazy driver. With the dryer in the back I’m driving like I try to drive all the time. The dryer reminds me to drive slower when I’m in a hurry as I don’t want it sliding around in the back. Or at least slightly amusing anyway.